In just 11 years Les Montres DeWitt have emerged into the circle of innovative luxury watch manufacturers. The brand stands for passion, curiosity, creative audacity, taste for innovation and open-mindedness. All in line with the personality of Jérôme de Witt, whose personal history has inspired the values of the brand which are focused on a futuristic vision of horological micro-engineering. Jérôme de Witt set up business in Vandoeuvres in 2002 in order to follow his dream. He engaged with the profession's best craftsmen, leading names in movement and watch design, goldsmithing, dial-making and the jeweller's art to execute his ideas. 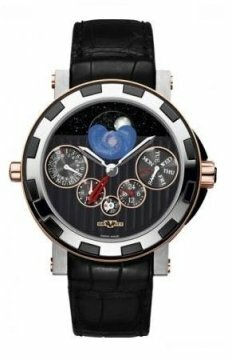 His designs are free from constraints imposed by tradition and breathe a sense of newness into the conservative world of timepieces. The brand aims for real innovation and creating of added value displayed in aesthetic considerations, tuned to perfection and expressed through a powerful design accentuated by original combinations of materials. This formal architecture is symbolised by the "Imperial columns", the ultimate interpretation of contemporary refinement and the company's emblematic signature. In 2003 in Basel the brand presented the Pressy Grande Complication, a world first, followed by the launch of an original technological concept: the Academia Tourbillon Différentiel in 2005. This model caused a sensation and won the Geneva Watchmaking Grand Prix in the Innovation category. Another innovative breakthrough in the form of new World First: the Tourbillon Academia Force Constante was presented at the International Watch Exhibition in Basel in 2006, setting the seal on a major innovation. Both key innovations are patented. The last four years have resulted in two patents and international recognition placing DeWitt in the ranks of the most avant-garde and elitist companies in terms of their conceptual and creative approach. The innovations of DeWitt testify to the spirit infused by one man in a company geared to the future of mechanical watchmaking, placing the timepiece in a different perspective. The manufactory of the 21st century is redefining Luxury watchmaking with a whole new interpretation of true luxury.